A new partnership between Tidewater Community College and Liberty Source PBC, an onshore business process outsourcing firm, has trained veterans and military spouses for newly created finance and accounting jobs at Fort Monroe. The Hampton-based company has hired 95 workers – half of them military spouses and 20 percent of them veterans. The jobs range from data entry to financial management on behalf of AOL Inc., the company’s cornerstone client. “Ensuring that veterans and military spouses find employment is a top priority for TCC,” said Bruce Brunson, executive director of the college’s Center for Military and Veterans Education (CMVE). Another priority is providing recognizable certification programs that allow military-related students to carry their skills with them. “This partnership achieves both of these goals,” he said. All of the employees recently completed customized training sponsored by TCC. After the two-day sessions, the 78 graduates earned the Six Sigma White Belt Certification, which focuses on quality improvement measures. After a U.S. Chamber of Commerce Hiring our Heroes event a year ago, Brunson learned of Liberty Source’s commitment to hiring veterans and military spouses. 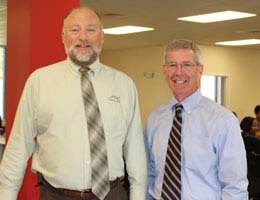 He offered TCC’s support services as educational providers familiar with needs of military-related students. Deena McCord-Merrill, project/program coordinator for military contracts programs, managed the project for the CMVE. from Training Modernization Group, Inc. 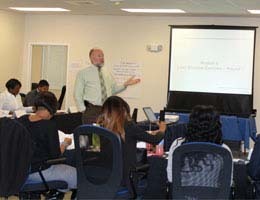 The training, provided by Training Modernization Group, Inc. (TMG), was provided onsite, and graduates earned continuing education credits from TCC. Liberty Source plans to hire as many as 600 employees as it attracts more clients. Liberty Source plans to continue working with the CMVE for future professional development opportunities.